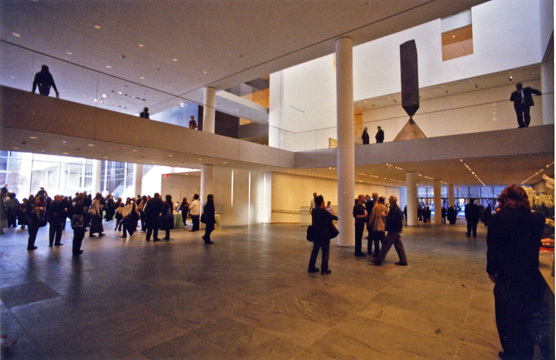 On December 8, 1997, the Museum of Modern Art in New York announced that it had selected Yoshio Taniguchi to design a major expansion. Taniguchi was one of three architects invited to participate in a design competition out of ten that had been invited to submit mission statements. The other two finalists were Bernard Tschumi, best known for his follies at the Parc de la Villette in Paris, and the team of Jacques Herzog and Pierre de Meuron, partners of Herzog & de Meuron Architekten in Basel, Switzerland and best known for winning an international competition for the Tate Gallery of Modern Art, Bankside, London, England. The seven who did not make the "cut" were Steven Holl, Rem Koolhaas, Toyo Ito, Rafael Vinoly, Dominique Perrault, and the team of Tod Williams and Billie Tsien. Taniguchi was the least well known in the eclectic and international group which surprisingly did not include many internationally famous architects such as Frank Gehry, Peter Eisenman, Shin Takumatsu, Arata Isozaki, I. M. Pei, Kohn Pedersen Fox, Arquitectonica, Gwathmey Siegel, Kevin Roche John Dinkeloo Associates, Richard Rogers, Renzo Piano, Nicholas Grimshaw, Sir Norman Foster, Moshe Safdie, Arthur Erickson, John Portman, Robert Venturi, Cesar Pelli and Philip Johnson, just to mention the most obvious possible candidates. Taniguchi graced the cover of The New York Times Sunday Magazine April 12, 1998 with a long article on his selection by Suzannah Lessard, an author of a book on Stanford White. "It is a fair measure of the general amazement that in setting odds for the architects who had been invited to compete for the commission, New York Magazine gave Taniguchi no chance at all," Lessard observed, adding that the competition had led to "grumbles" in "avant-garde circles and from the older generation of architects who had been excluded from the competition" that the museum "had flubbed a chance to commission the most important contemporary building in the world...[and] Instead, the museum had made a cautious, uninteresting choice." Ms. Lessard, however, proceeded to wax poetic at great length about the correctness of the museum's choice, maintaining, cavalierly and absurdly, that "what criticism there has been does not hold up to examination," adding: "To begin with, Taniguchi's design is tailored to a densely urban site in which architectural extravagance would be inappropriate, perhaps impossible. More importantly, when one looks closely at Taniguchi's design with a knowledge of his work, one feels confident that this new Modern will not only work well for all who use it but will also be beautiful. Within the conventions of Western modernism, however, beauty itself is not a legitimate aspiration." Despite the fact that Ms. Lessard went to Japan to visit with Taniguchi for the article she apparently was unaware of the countless wonders of "architectural extravagance" in "densely urban" sites that are all over Japan and are not only wonderful but beautiful! Like most Japanese designers, Taniguchi has a refined, delicate sense of grace and beauty and his proposed design is not inelegant. It is, however, not inspired and this commission is a major missed opportunity for New York. In the fall of 1997, the museum held a exhibition of the ten architects' mission proposals and it was very difficult to get any clear idea of what anyone was planning as the statements and models were dense, abstruse, and a bit wacky. After selecting Taniguchi, the museum held an exhibition from March 3 through April 28, 1998, on the specific proposals of the three finalists. This exhibition was more successful as the models and drawings were quite comprehensible. Perhaps more importantly, the museum issued a 343-page book with more than 325 illustrations, "Imagining the Future of The Museum of Modern Art," part of its "Studies In Modern Art" series, and it is a fascinating , provocative and important book that documents not only the museum's considerable architectural history but also an extensive series of "conversations" and lectures that the museum held prior to its final selection with a variety of architects, curators, and artists on the mission of the museum. It is clear from the book that the museum earnestly sought a great deal of input from many sources and was sensitive to the great complexities of tinkering with one of the world's most famous gardens and modern art collections. The book and the exhibition, however, offer no clues as to the selection of the ten architects, then the three finalists, and finally Taniguchi. Taniguchi's winning proposal, shown above, is very conservative, very elegant and very clean cut. It does away with Pelli's cascading windows fronting on the garden to permit his Museum Tower to be exposed to the garden. It also replaces the great black metal and glass facade of Philip Johnson's east wing fronting on the garden, shown below, and creates two boxy, honed slate structures on either side of the garden on East 54th Street where the westerly structure will replace the former Dorset Hotel, designed by Emery Roth, that the museum recently acquired along with two smaller properties on East 53rd Street. Johnson's luscious and beautiful black facade should not have been replaced, although Terence Riley, curator of the museum's architecture department, indicated in an interview at a reception at the opening of the exhibition of the finalists' designs that Johnson did not raise objections to Taniguchi's removal of his garden facade. Taniguchi's design has a sleekness that is not inappropriate for MOMA, but it is a disappointing choice especially in a post-Frank Gehry/Bilbao Guggenheim Museum world. The most exciting proposal of the three finalists came from Jacques Herzog and Pierre de Meuron, who created a prismatic tower to the west of the Museum Tower that was very dramatic and daring. 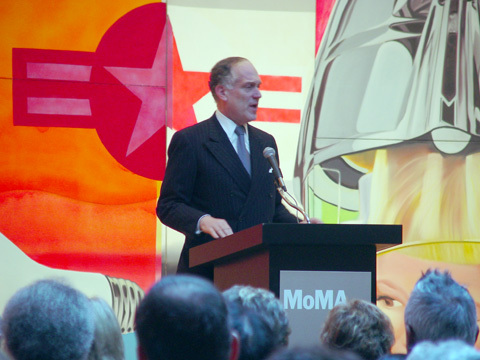 The museum appointed a committee of museum trustees and officials composed of Ronald S. Lauder, the museum's board chairman, Agnes Gund, the museum's board president, David Rockefeller Sr., chairman emeritus of the board, Glenn D. Lowry, the museum's director, Marshall S. Cogan, Jerry I. Speyer, the chairman of the museum's expansion committee, and Sid R. Bass, the chairman of the museum's selection committee, to choose a new architect and to travel extensively with curator Riley to visit Europe, Japan and sites in the United States to view various architects' works. Three other museum trustees, architects Edward Larrabee Barnes and Philip Johnson, and Barbara Jakobson, served as advisors to the selection committee. Ms. Lessard reported in her magazine article that "Herzog and de Meuron came up with something sensational, a design that was probably closest to what the committee had in mind when it embarked on its journey." "The architects," she continued, "are known for their original use of glass and metal screens on facades. Their proposal for MOMA included a combination of movable partitions and glass facades that promised a sumptuous effect. Most attention-getting, however, was a curatorial tower that rose beside the Pelli tower, an abstract shape with adze-like sculptural planes." This aspect of their design was an asymmetrical, tottering, teetering spindle that looked something like a Space Age probe about to launch precariously, but mightily. It was closest in spirit to modernistic airport control towers. The brilliance of the proposal was its scale, which was modest in the lee of the looming Pelli tower and yet potent in its compactness and flair, a marvelous counterfoil to the tower and a significant sculptural addition to the city. Indeed, the tower might well have become the most important modern sculpture in the museum's collection. Brancusi would have certainly approved. The design, according to Lessard, originally "swept the group away" but doubts arose: "First came concerns about a seeming indifference to practical matters, like placing a roof garden with alternating skylights and pools of water over a gallery with no thought given to the danger of leaks. Then came concerns about the impracticality of the curatorial tower, which grew as the committee realized that the external shape of the tower would make its offices exceeding peculiar - with space for only a single room per floor toward the top. Given these difficulties, it was thought that the design would probably have to be altered into something more conventional. Or, on the other hand, if the sculptural shape was retained in spite of the difficulties, the tower might become known as the Edsel of the design world. Following on these thoughts was the specter of the tower's becoming a cartoonist's favorite, a symbol of conspiracy and paranoia in the curatorial offices of the Museum of Modern Art. Thus poor Herzog and de Meuron's rating went from masterpiece to nightmare." Such concerns, of course, are legitimate, but should not have been paramount and were not necessarily insurmountable problems. Bernard Tschumi's design, shown below, was also more interesting than Taniguchi's in its replacement of the Dorset Hotel with a through-block mid-rise structure with large, billboard-size, angled indentations on its east and west facades for electronic signage and art, and extensive skylighting. Tschumi's massing was a bit clumsy. The billboard superstructure appears in his model as a huge bunker, although the notion of such large facades for electronic art at the museum is definitely intriguing and not inappropriate. Rem Koolhaas's design, shown below, was a bit similar to the Herzog/de Meuron proposal in its angular tower that serves to punctuate the enclave with considerable elan. His tower extends closer to 54th Street and is more highly visible from both the garden and Fifth Avenue than the Herzog/de Meuron tower. Clearly this design and that of Herzog/de Meuron recognized the important opportunity to offset the prosaic rectilinearity of the Pelli tower and apply the museum's mandate for modern design to create an important and interesting abstraction. Ideally, the museum could have combined the designs and also incorporated Tschumi's billboard elements to truly justify the demolition of the Dorset Hotel, which is not a bad sidestreet building. Steven Holl's designs, shown below, are less dramatic than the Herzog/de Meuron and Koolhaas designs, but their unusual fenestration and wide variety of skylit galleries were particularly striking. Holl is an architect of poetic spaces and his fine design here called for many different shaped galleries with different shaped windows that would permit a wide range of visual and textural experiences. "It's a happy beginning for MOMA," Ms. Lessard concluded in her article about Taniguchi's selection. Not really. It is rather pathetic and cowardly. She emphasized that his design was very sensitive to curatorial and circulation needs and those are definitely very important. It does not, however, rise to civic needs and the important role of the museum in design leadership in a city where exciting modern architecture has not been warmly welcomed for several decades. If the choice of architects invited to the competition and the final selection was surprising, the museum deserves great praise, nonetheless, for its publication, "Imagining the Future of the Museum of Modern Art." The selection process, it demonstrates, was a learning experience that was not undertaken casually. 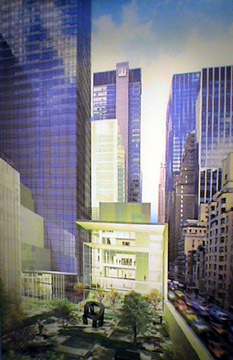 The museum, Lowry wrote in the catalogue, considered such expansion options as purchasing a second site elsewhere in the city, excavating under the Abby Aldrich Rockefeller Sculpture Garden, building on top of the Donnell Library across 53rd Street and even moving the entire museum to a new location. The trustees, he continued, decided that the Dorset site provided about 250,000 square feet of expansion potential and "the only coherent way to expand, while retaining the sense of the Museum as a single, integrated entity located in Midtown Manhattan." The expansion, moreover, "required not merely new spaces but fundamentally different spaces," Lowry maintained. The Museum, he continued, realized fairly early in the process that it "needed to find a way to theorize its space rather than simply to plan its architecture; that the Dorset site accentuated the urbanistic challenge of the Museum to mediate between the experience of the city and of looking at art; and that, in order to stay modern, the museum had to avoid becoming merely a treasure house or safety deposit box. Additionally, there was agreement that the Museum needed to diversify and complicate the experience of looking at modern art for that experience of art to remain startling and compelling." Lowry wrote that the three finalists chosen for the competition were selected "on the merits of their charettes and the degree to which they had met the criteria established by the Selection Committee." "In choosing them, the committee cited Herzog and de Meuron, for their thoughtful and provocative ideas, which reflected a keen awareness of the evolving role of museum architecture in shaping the appreciation of art; Taniguchi, for the elegance and clarity of his design concepts as well as his sensitivity to light and space; and Tschumi, for his profound understanding of curatorial issues, the Museum's mission, and his exciting reconception of the site." 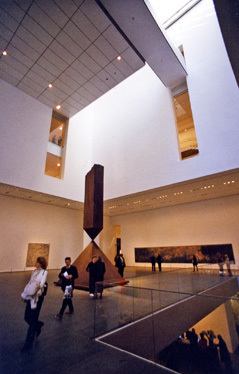 In his opening remarks at the first of several meetings in 1996 on the proposed expansion, Lowry observed that "the strength of The Museum of Modern Art has been its ability over the years to reinvent itself." "In fact," he continued, "I think we have already undergone six substantial renovations in our sixty-seven-odd years of history...Architecture is a catalyst for the Museum. In part, I think that's because, unlike many other museums, architecture is not only an object for us - a shell, a space, an environment in which to articulate a program - it is also a subject. We collect architecture and design; it is a field of study, and anything we build, by definition, becomes one of the principal proponents of our larger collection." At the same meeting, Lauder, the chairman of the museum's board, said that "there was a very strong feeling that...the architecture [should] be as exciting as possible. As opposed to something that was safe, they want something that will really reflect modern architecture." Kirk Varnedoe , the museum's chief curator, maintained that the museum is an institution "of constant argument, debate, questioning" about the "continuity of modern art" and that "the march of the permanent collection galleries in painting and sculpture now leaves you virtually no choices. One of the hopes we would have is not only would the story we're telling get more complex and more diverse and more of our collection would be visible in different contexts, but that we would not lose the sense of a main thread, the sense of a graspable parade for what we feel are some of the greatest achievements of modern art; that there should be some sense of mainstream, but that it would be punctuated, adumbrated, expanded, by a series of alternatives in which one might go into greater depth in a particular period." The museum invited many architects and artists to participate in a series of "conversations" about the museum and these are included in the excellent catalogue. At one, Richard Serra, the sculptor best known for bisecting a major public plaza downtown with a large piece of steel, suggested that the famous garden "has to go" since "It has nothing to do with the way sculpture is going to be seen in the next century." Peter Eisenman, the architect, subsequently remarked that he could not agree more with Serra's thinking the "impossible," adding that when Serra compared Philip Johnson's garden to "a sacred place in a temple, it may have had its time." Hopefully, Serra will move to New Jersey and take his "art" with him and stay out of New York's "garden." Eisenman, on the other hand, is much too important an intellect to banish from the city. At another "conversation," Adam Gopnik of The New Yorker magazine commented on the importance of having diaper-changing tables in the bathrooms and about "how hard it is to get to the art" when one enters a museum and about how generally overestimated are the "storytelling powers of museums." "It seems to me," Gopnik argued, "that the notion that there's a kind of strange, occult, coercive power in the way that pictures are lined up one after another is simply false to all of our experiences of museums and going to look at pictures. So it seems to me that it's almost more important, as we think about this new building, to worry less about the kind of story we're going to tell than the notion that the story should begin immediately, that is, that it's terribly important that whatever this building does that the singularity of it has got to be that it's a place that devoted to...looking at things." 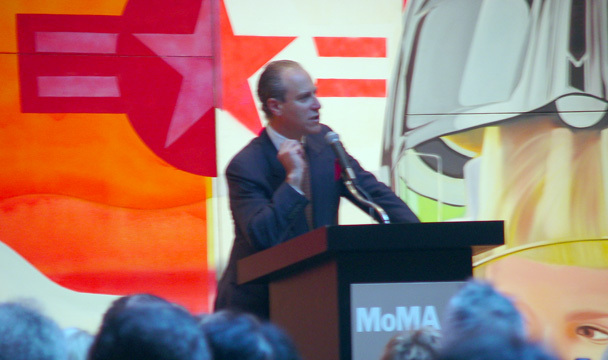 John Elderfield, deputy director for curatorial affairs and chief curator at large at MOMA, noted that in the museum's 1984 expansion a visitor could discern that he was in an historical section of the museum if the gallery floors had carpets on them and if not they were in a contemporary section. Tschumi raised questions about "staging" and who has the authority to "frame" a visitor's experience, adding that "the power to take shortcuts is something that is very often missing in museums." The conversation turned to "spines" and "sponges" in terms of gallery organization, but returned to the propriety of "storytelling." Gopnik advised the meeting not to be afraid "to a tell a story that you think has a great deal of authority out of fear that this will somehow have some kind of hypnotic power over the masses." James Cuno, the Elizabeth and John Moors Cabot Director of The Fogg At Museum at Harvard University, ended the meeting with the observation that it was the museum's "job not to be absolutely right but to be clear, so that the people who want to argue against the Museum have something clear to argue against. If it's chaos, it's pointless...."
In the next "conversation," architect Arata Isozaki noted that "the relation between contained and container...[is] very problematic at the moment," as many contemporary artists want to be the architect and the architects want to be the artist. John Walsh, the director of the Getty Museum, viewed digital information technology as "something analagous to the creation of photography" and that the user of such technology now "deals in nonlinear progressions; one moves in, one moves back again, one moves sideways with alarming ease between bodies of information. We know the information is increasingly non-proprietary; you can't own it....It's a world that is naturally anarchic. Its sources are more grass-roots than institutional, not centrally sanctioned or guided, not top-down but generally bottom-up, and increasingly threatening to, if not actually subverting, the distinction between the real and the virtual....I think all of [our] museums will be progressing towards a greater level of honesty and usefulness to our visitors, if we come out from behind the anonymity, the sort of godlike voice of authority that we have traditionally adopted." After a discussion of "hyperlabels," Cuno again brought the "conversation" back to center: "One must educate rather than simplify or reduce. But technology tends to encourage expectations of instant gratification: they all want it now. One of the great things about museums, and one of the things that I think the Modern has got to insure, is that museums are a slowing-down experience, as opposed to most of life, which is about speeding up experience." He also was skeptical about "the illusion of the transfer of power in technology, that is, that it's going to be transferred from the work of at itself, say, to the beholder, who can now interact with it and begin to manipulate it." 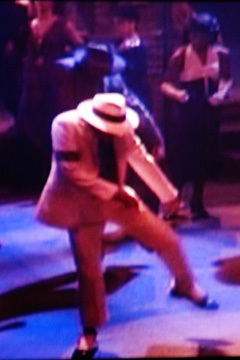 "One of the great things about works of art is the humbling experience of being powerless before them," Cuno cautioned. Serra and Walsh both noted that the demographics of technology users was predominantly male, young, educated and white, and not exactly the only community that museums "want to bring in." Elderfield noted that a comment by Rem Koolhaas that the popularity of museums is threatening their very reason for being, "obviously strikes a chord in anyone who's been to a very crowded exhibition." Elderfield said he was impressed by the architect's remark that "anyone who settles for the artificial saves part of the organic," a suggestion that Elderfield said would please those interested in the conservation of art. Lowry noted in an essay in the catalogue that there are 1,241 art museums in the United States, more than half of which have been opened since 1970. The museum began in six rooms with a total of 4,500-square feet of space that it rented in the office building at 730 Fifth Avenue in 1929. Three years later, it relocated to a five-story townhouse at 11 West 53rd Street that it leased from John D. Rockefeller Jr., the husband of Abby Aldrich Rockefeller, one of the museum's founders. In 1936, the museum acquired the townhouse and three adjacent ones and commissioned Philip L. Goodwin and Edward Durell Stone to design a new building, which contained 109,100 square feet and opened in 1939. In 1951, Philip Johnson designed a 7-story annex to the west at 21 West 53rd Street and two years later completed work on the sculpture garden. In 1964, Johnson designed a new east wing, redesigned the lobby and expanded the garden by one-third. In 1968, the museum purchased the former facility of the Whitney Museum of American Art on West 54th Street and Johnson and John Burgee studied the further expansion to the west of MOMA including a possible office tower. 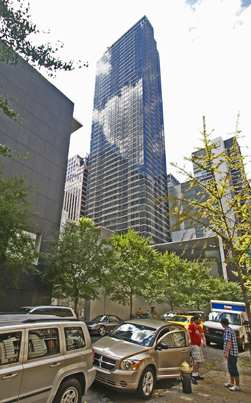 The tower began a residential tower under Cesar Pelli's plan in 1984. The acquistion of the Dorset Hotel will permit MOMA to break away "from its narrow longitudinal access," Lowry wrote in the catalogue," permitting it to "create a new, broader and deeper, footprint that should result in a fundamentally different alignment of galleries and offices structured around a central core." "It has become clear that there is no single story of modern art to be told, but, rather, many stories, each imbedded and refracted to a certain degree in the others," he wrote. Robert A. M. Stern, the architect, told a panel on "The Museum and Society" that he "was thinking that maybe the Dorset Hotel should just be left alone and each artist should be given a room, a guest bedroom, and allowed to what he or she wants to." Heresy? Not really, but a cry obviously a bit too late. The Dorset is good, but not great architecture. 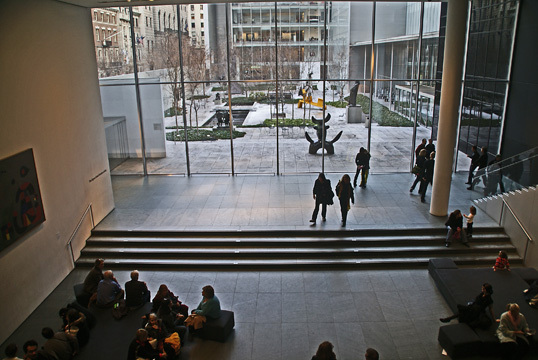 MOMA is a very important New York institution and its expansion is important. The mistake was the shortsightedness of the 1984 expansion and its paltry and uninspired museum gallery spaces that look like a not terribly successful nor large suburban shopping mall. "This place once had an intimacy about it; it doesn't have an intimacy anymore," Stern lamented. Crowded galleries, however, are a fact of life and a reason for expansion. Stern, in fact, argued that it is important to see art with other people and artist Fred Wilson observed that the "cyberworld is going to in many ways enlarge the audience for the actual experience of a work of art." Wilson, however, added that many museums now are experienced as "a party space, basically as a great hall, and art-viewing is ancillary to what has become its main purpose." Riley noted that despite the need to have flexible space - what he calls "dumpster architecture" - it is important to "uphold the contract that I feel The Museum of Modern Art has with the artists it represents, which is that we will show their works of art to their best advantage." The glory of the museum, at least from an architectural viewpoint, is its garden, widely considered, justifiably, as the finest oasis in the city. Although it has been modified often, it remains serene. Johnson and landscape architect James Fanning created the city’s most justly celebrated garden in 1964 on the 54th Street side of the through-block site. The original Goodwin/Stone building with its punched-out roof canopy is one of the landmarks of the International Style movement and Bauhaus design. Over the years, it has been modified only slightly: large panes of clear glass replaced glass blocks at the 53rd Street entrance. Its expansive white marble facade, delightful and breezy perforated top and its large banners have always been refreshing - a surprising, for New York, presence of cleanly modern simplicity of fine proportion, correctly scaled to its midblock location and sufficiently understated to be good-neighborly to its townhouse environment when it was erected. It has fortunately survived and is now wedged between two very dissimilar major structures: Philip Johnson’s black steel and black glass extension to the east and Cesar Pelli’s multi-colored glass Museum Tower to the west. As a student at Harvard University, Johnson was introduced by his sister, Theodate, to a professor at Wellesley College, Alfred H. Barr Jr., who subsequently became the first director of MOMA. In a few years, Johnson teamed up with Henry-Russell Hitchcock to coordinate a major architecture exhibition at MOMA and write a book on the International Style in 1932, after which Johnson was named chairman of a new department of architecture at the museum. At the same time as Johnson was planning the western annex, MOMA was entering discussions with The Whitney Museum of American Art that had recently acquired property behind it on 54th Street. The Whitney was moving uptown from its elegant and handsome building on West Eighth Street in Greenwich Village. The Rockefeller family, meanwhile, wanted a memorial to Abby Aldrich Rockefeller (Mrs. John D. Rockefeller Jr.), who had died in 1948, and it decided to build a new garden at MOMA. The original garden had been laid out mostly by John McAndrew and Alfred Barr, according to Franz Schulze, the author of “Philip Johnson, Life and Work,” a superb biography published in 1994 by the University of Chicago Press. It had been asymmetrical with free-standing walls, some of which were curved and was enclosed on 54th Street by a wooden stockade. “The plan seems arbitrary, the trees meager, the inner and outer walls casual bordering on tacky. Nor do the photo records of Philip Goodwin’s 1942 alteration show much improvement. Principally, Goodwin added refectory facilities, centered in a pavilion where food, wine and beer were served. It looks a spindly affair, with a modernoid slope to its roof and grove of trees nearby whose formal organization seems out of keeping with its informal placement and the irregular pathway around it,” noted Schulze. The Whitney’s building, designed by Augustus L. Noel of Miller & Noel, the firm that had designed the museum’s Eighth Street facility and whose partner, G. McCullough Miller was married to Gertrude Vanderbilt Whitney’s daughter, Flora, framed the west end of the garden with a raised deck for open-air dining in front of a glass-enclosed cafeteria that sadly was removed in the subsequent reconstruction by Cesar Pelli for the new Museum Tower. Johnson, in fact, designed the Whitney’s east wall since it faced on his garden, which was completed in 1952, the same year that Johnson renovated the Members Penthouse in the Goodwin/Stone building. In 1959, the museum announced plans for a new, 8-story wing on West 54th Street, but the plan was revised in 1961, in part because of concerns about shadows it would cast on the garden. The new design by Johnson called for a two-story pavilion at the east end of the garden and an expansion of the Rogers building on 53rd Street, and a new building to replace two owned by Mrs. E. Paramalee Prentice, the sister of John D. Rockefeller Jr., at 5 and 7 West 53rd Street. The Rogers Building expansion was not undertaken as originally planned, but Johnson created a new black-painted-steel-and-glass building on the Prentice site in 1964. Zion & Breen helped Johnson make a modest redesign of the garden that included staircases leading to the roof of the new pavilion overlooking it. The new eastern annex, which houses a large bookstore at street-level, is a great building. The corners of the window frames are softly curved, yet their subtlety does not detract from the formidable strength of the building’s darkness and the very large windows. Pelli’s reconstruction of the museum to accommodate the new high-rise condominium apartment tower to the west incorporated a major expansion and redesign of the museum. The mixed-use expansion works quite well visually from the garden where it cascades downward from the tower rather like an angled, as opposed to bulbous, Beaubourg Museum. One critic, Vincent Scully, however, was not amused: “...the flapping piece of flashing with which it is tenuously connected to the roof of the older building can hardly be credited,” adding, in his book “American Architecture and Urbanism,” revised edition, 1988, Henry Holt and Company, that the tower’s “bulk severely compromises the privacy and scale of the sculpture court behind it....” Actually, the cascading skylights referred to by Scully bear a remarkable similarity to famous treatments by architect James Stirling and are the best feature of the expansion. Inside the museum, however, the tower expansion is very disappointing as the low ceilings and Scandinavian-style minimalism simply appear cheap, which is all the more infuriating given the incredible personal wealth of the museum’s board of trustees. It can be argued that the low ceilings of the broad 53rd Street entrance can be tolerated because once past the admission takers the space opens up to the large windows facing directly on the great garden. Nonsense! The crass commercialism of the cashiers and the large information desk should have been crowded together with the rather nice coat check area and the low entrance area at least kept open to appear to be more inviting with gracious vistas of the garden. The area directly in front of the garden from the entrance, also is given over to escalators and is always busy given the museum’s deserved popularity. In good weather, of course, such petty objections are superfluous as the glories of the garden are self evident and need no promotion. There is something to be said for the delight of shifting perspectives of the garden as one rides on the escalators, however. A lovable Picasso animal sculpture animal used to grace the entrance hall, but is removed during blockbuster exhibitions when the lobby takes on the bustling atmosphere of a subway station and is only missing a three-card monte game. The museum’s gift shop and bookstore, in the black Johnson annex to the east of the main entrance, fortunately can be entered directly from the museum lobby as well as from the street. The bookstore, which also sells posters and cards is quite good and the downstairs gift store is pleasant and not quite as overwhelming as its large annex that opened in the late 1980s across the street at 40 West 53rd Street. While modest in scale, Johnson’s annex is one of his finest designs: sleek, powerful and quite articulate. 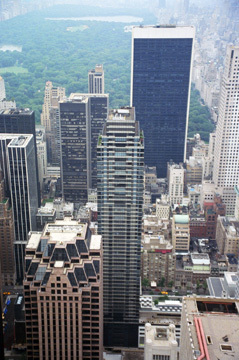 It is an excellent counterpoint to the white-and-gray main building especially with its rounded steel window frames complementing the port-holed roof canopy of the original building, and its facade and generous proportions make it a classic in the league of the far larger and more celebrated Seagram Building and Lever House. Johnson had also designed a similar small wing for the west side of the museum that was replaced by the new Pelli tower. The Goodwin/Stone main building is not as aesthetically pleasing as Johnson’s annex, although historically it is quite important. Essentially, this is a minimalist factory facade, enlivened by by the fine roof canopy that unfortunately is not highly visible from the sidewalk, and the museum’s fine tradition of hanging colorful banners. The perforated roof canopy covers a pleasant small terrace accessible only to museum members. When the museum first showed renderings of Pelli’s expansion, the tower promised to be very delicate and interesting because Pelli emphasized that 14 different colors would be employed on its glass curtain walls. The horizontal banding of the curtain walls defers nicely to the original Goodwin/Stone facade, but the rendering suggested a Mondrianesque patterning because of the different colors. Sadly, it is very hard for the naked eye to discern much variation in the blues and greens that were installed. Indeed, it is very hard to believe there are 14 different colors on the tower. The midblock tower, which has a sumptuous but conventionally luxurious modern entrance of its own, has nice proportions, but has been sited in probably the worst spot on the site as far as casting shadows on the famous garden. When I raised this issue and suggested that the tower should have been placed on the 54th Street side of the site, I was told that studies had been made and that it would not cast shadows. They were wrong and I was right, although all the civic activists, who would later make much of shadows in the public debate over the redevelopment of the New York Coliseum on Columbus Circle, declined to take up the issue, a possible reflection of their affection for the power elite, or plain stupidity. The museum desperately needed to expand and the interior expansion works relatively well in terms of circulation. The museum of course, could have brought up most of the rest of the block to the west, which has been lying fallow for some time since the Museum of American Folk Art has not bothered to build a great skyscraper designed for it by Emilio Ambasz, a former head of the Museum of Modern Art’s Department of Architecture, who certainly should have been considered by the Modern Museum for any expansion. With rare exception the museum’s new expanded galleries in the tower are...cheap and embarrassing. The museum clearly needs much larger and better galleries and an even larger garden. The garden, hopefully, could be expanded to the east where it could end in a series of terraces. 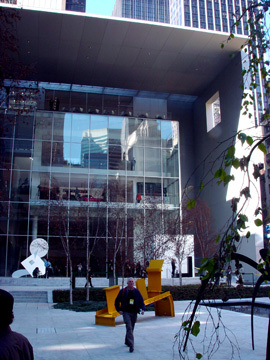 In 1994, the museum, which is closed Wednesdays and open late on Thursdays when visitors may pay whatever they wish for admission, created a 54th Street entrance to Sette MOMA, a restaurant that fronts on the east end of the garden, which recently underwent another unnecessary and badly executed rearrangement and reshuffling of its sculptures. The catalogue of the museum's new plans and the competition, which is available at the museum's bookstore and is not too expensive, is a provocative and fascinating document of a very complex process. It does not explain the quite puzzling original selection of 10 architects and it does not include the transcripts of the selection committee's final deliberations that would be of the highest interest. One reads the catalogue and comes away with respect and confidence that the museum is now fully aware of and sensitive to the major issues confronting museums in general and itself in particular. One expects that the finished project, anticipated for 2004, will be a much improved museum that maintains its sensibility of the modern and of elegance. It will not be dazzling, but dazzle is not necessary for every project, and the most important thing at the Modern is its collections and they are dazzling. The museum’s art overwhelms most of the quibbles. The collection has landmark paintings by Matisse, Picasso, Van Gogh, Cezanne, Miro, Picabia and Rousseau and covers Cubism, Fauvism and Surrealism authoritatively and has by no means neglected modern sculpture. Its design, architecture, photography and film department have consistently set international standards. Despite chagrin over this lost opportunity for the museum's new expansion to have created something sensational and exciting, it surely will result in improved galleries and Taniguchi's plan adheres to the museum's esprit. The museum's collections and its garden are among the very most cherished treasures of 20th Century New York. They significantly help to define the world's most definitive city. The Taniguchi expansion created a through-block lobby that also opens directly onto the garden and is open to the new atrium above. The biggest change to the garden is its north wall and its east and west ends. The north wall, sadly looks cheap, especially from the street. The east and west ends, however, are impressive becasue they are significantly tucked under large roof overhangs and are walls of glass. The atrium is several stories high with slit openings and a "skybridge" adding some drama. The south side of the garden contains restaurant spaces. The museum's expansion continues as it entered an agreement with Hines Interests to expand into the lower part of a very major and dramatic mixed-use tower on the former site of the Dorset Hotel. That tower has been designed by Jean Nouvel (see The City Review article) but Amanda Burden, the chair of the City Planning Commission, ordered that 200 feet or so be lopped off its top to preserve some views of the Empire State Building! A revised and lower design is in the works. In addition, the museum subsequently acquired the former American Folk Art Museum and presumably will use some of its unusual spaces. 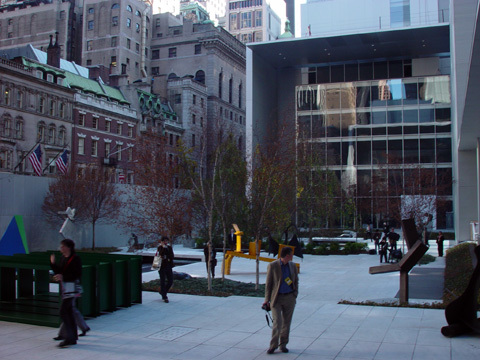 The American Folk Art Museum, which celebrated its 50th anniversary in 2011, is selling its building on West 53rd Street to MoMA to eliminate its $31,900,000 bond debt. Its dramatic building was designed by Tod Williams and Billie Tsien. An excellent article by Witold Rybczynski on "Keeping The Modern Modern" appeared in The Atlantic Monthly, October, 1997 before the final selection of Taniguchi.